ISSN number : ISSN 2311-4630 | Abbreviated title: J. bio-mol. scie. 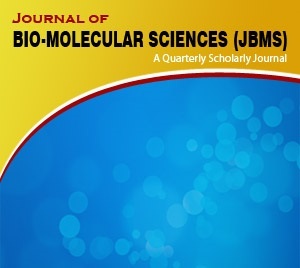 Journal of Bio-Molecular Sciences (JBMS) publishes original research papers as well as review articles that deal to the developments in the area of bio-molecules. The novelty of research is the prime focus of publications in Journal of Bio-Molecular Sciences.. This journal is a multidisciplinary journal in bio-molecular sciences and covers the areas of bio-technology, molecular biology, bio-medical Sciences, bioinformatics, pharmacognosy, pharmacology, medicinal biology, microbiology, systems biology (genomics, proteomics, metabolomics), toxicology, molecular therapeutic and other related areas. In addition to chemistry, the journal is interested to publish research of bioactive components, their reactions, products, by-products, industrial applications, processing and processing waste and new protocol developments. Publications include original research papers, review articles and short communications. Whereas, Journal of Bio-Molecular Sciences will not consider papers of social sciences. To view specific article move to desire volume and issue from side bar. Heavy metal contamination of soil decreases microbial diversity and causes bacterial communities to lose part of their degradative capabilities. The present work is mainly related to Nickel (Ni) toxicity. Ni is the twenty fourth most abundant element of the earth’s crust and has been detected in the biosphere. High concentration of Nickel frequently inhibits enzymatic activity, DNA replication, transcription and translation by binding to proteins and nucleic acids. We investigated the impact of Ni-stress on the soil bacterial populations in artificial microcosmic conditions as well as compared the artificially created stress with the natural long term heavy metal stress to bacterial populations. Microcosmic conditions were provided by using sterile test tubes for two different intervals (24 and 48 hours) by addition of 20g soil and Ni treatments (500, 1000 and 1500 ppm). Our results showed that Ni stress significantly reduce the bacterial densities as compared to control without Ni contamination. The impact of Ni increased with increase in its concentration. The isolates were picked and characterized using different biochemical tests. The bacterial strains isolated in the study may be useful for bioremediation of heavy metals. Similarly, identifying the enzymes produced in the Ni resistant strains will also be an important future perspective. Pollution caused by heavy metals affects all forms of life. Pakistan is an agricultural country. The soil of Pakistan is rated low in fertility to fulfill our economic demand. Due to the lack of awareness in farmers, fields are irrigated by agricultural land disposals, mineral, industrial wastes and use of fertilizer. Areas especially Islamabad, Rawalpindi, Faisalabad, Lahore, Sheikhpora, Kala Shah Kaku, Multan, Kallarkahar, Kalarkahar-Lilla and Lilla-Lahore, Peshawar, Mardan, Sawabi, Nowshera, Charasda, Khyber agency, Kohat, and Karak are contaminated through industrial contamination, fertilizer, automobile, mining and natural constituents of the soil. Toxic levels of heavy metal contamination pose a serious threat to the microorganisms, animal plants and human life. Plants exposed to heavy metals result injury in terms of chlorosis along with toxic effects in the form of reduced photosynthesis, browning of root tips, growth inhibition, and finally death. Soil microbial population is highly affected by the presence of heavy metals. In human and mammals, neurological damage, immune system suppression and fetal abnormalities are reported due to the toxic effects of heavy metals. Live stock affected due to toxicity of heavy metals enters into the food chain can cause serious economic and health issue. Present study reports the Agrobacterium-mediated genetic transformation of bentazon resistant gene (Cyp81A6) in cotton genotypes (Coker 312 and Coker 201). Main aims were to genetically transform Cyp81A6 in cotton genome and to perform non-PCR and PCR-based confirmation studies regarding its stable transformation. The embryogenic calli (EC) were first inoculated with the Agrobacterium tumefaciensstrain LBA4404 carrying foreign gene (Cyp81A6) and were transferred to the selection medium having kanamycin (100 mg/L) for 4 weeks. Embryogenic calli were stunted in growth in both cultivars when transferred to selective MS medium. The kanamycin resistant (Knr) calli grew well after few sub-culturings. Knr and benr assays showed greater percentage of Knrembryogenic calli. Also EC of Coker 312 showed greater resistance than Coker 201. Both genotypes profusely produced tulip shaped somatic embryos; however, their number was more in Coker 312 as compared with Coker 201. Molecular analysis of putative transgenic calli confirmed the presence of Cyp81A6 in the genomes of Coker 312 and Coker 201. Present study reveals that both cotton genotypes were efficient in integration of the gene and grew well on normal and selective MS media. Methanolic leaf extracts of Ricinuscommunis collected from different climatic zones of Pakistan were screened for antimicrobial activity against different Gram-positive and Gram-negative human important pathogenic bacteria as Escherichia coli, Staphylococcus aureus, Salmonella typhi, Klebsiellapnemoniae, Shegella, Vibreo cholera and Proteus, by using agar cup diffusion method. It was found that all Ricinuscommunis species from different origin shows high zone of inhibition against the tested pathogens. These results demonstrated that R. comminus contain potential components that may be beneficial for evolution of pharmaceutical and can be use as a medicine against different types of bacterial phathogenic flora of human body. Copyright 2016 Directsciences. All rights reserved.